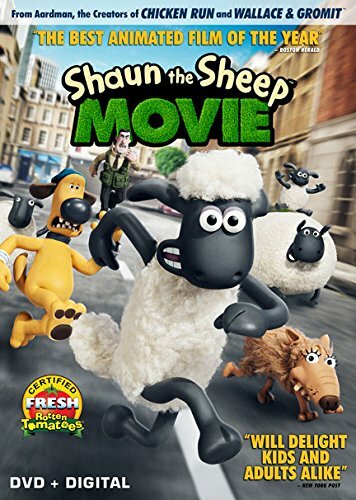 The Shaun the Sheep Movie is a stop-motion animated film that contains absolutely no dialog. All communication is done either through gestures, expressions, or mumbling-type noises that characters will occasionally make. This lack of dialog makes this a very visual movie, one that you must pay attention to and not be fiddling around with your phone or laptop. I guess that's one way to get people to pay attention! And despite having no dialog, it's still a funny movie and you always understand the ideas that the characters are trying to get across. The animation is great for stop motion. Sometimes I even wondered if it my by CG made to look like stop motion, but I don't think that's the case. At any rate, it looks great. The story find a sheep named Shaun that is getting tired of the day-to-day rut so he devises a plan to get the day off. It seems to work at first but then things go wrong and the farmer accidentally ends up unknowing heading straight into the big city where he gets conked on the head and loses his memory. Shaun and the gang must then venture into the city to bring him back while avoiding a particularly nasty animal catcher guy. And even once they find him, they still have to deal with his amnesia as he no longer remembers being a farmer and has since stumbled his way into being a famous hairdresser. So yeah, it's a quirky movie and I it was really great to see Shaun and his pals navigate the city especially once they all dress up as humans, like with one sheep standing on top of the other in a trench coat type of fashion. Along with the movie, this release also contains some extras such as a making-of featurette, a behind-the-scenes featurette, a Meet the Characters featurette, a Meet the Crew featurette, and a gallery of parody posters. As extras go, those aren't too shabby. And while I did enjoy the movie, I think you may want to rent it first as afterwards I didn't have much of a desire to watch it again. Shaun the Sheep Movie , released by Walt Disney Video, is available starting November 24, 2015.